A huge thanks to Stikwood for providing makeover supplies for this project. But there was this one old abandoned barn on a backroad near my house. Whenever my mom and I drove by it on the way to my elementary school each day, I would wonder what it used to look like before the roof started caving in and the weeds started engulfing it. Someone once loved that barn when they stepped back to admire their work after building it with their own two hands. I asked my mom one day if we could stop and take a look inside and she looked at me like I was crazy and said, “Um… it’s probably filled with snakes and spiders.” Nevermind. Keep on driving! But I still loved it from afar. Then the other day, I finally got a little piece of an old barn for our own house, and I fell in love all over again. Thankfully, I didn’t have to fight the snakes and spiders to get this pretty reclaimed wood pile though. (So not happening!) We used Stikwood instead. I’d been wanting to try it out ever since I heard about it a year ago. 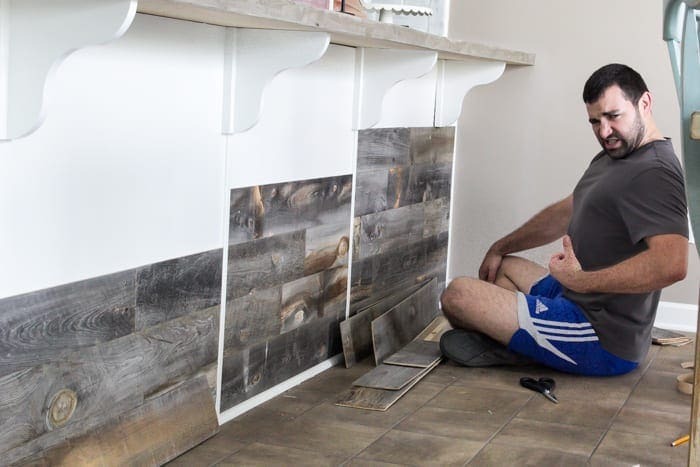 Way back in the beginning stages of planning our kitchen makeover, I knew I wanted some kind of wood on our bar / peninsula since I predicted kicking feet would constantly scuff and chip our cabinet paint. And I wanted to break up all of that white a little bit to add some interest and texture while also tying in some of the brown tones in our wood beam doorway. At first, Robert and I really didn’t plan ahead and just started peeling and sticking the wood where we liked it (we were um… a bit too excited), but once we got in our groove, we figured out it was best to alternate light and dark tones and try to alternate cuts. It was really simple though. Whenever we needed to trim any of the wood planks, we just used the square tool to mark a straight line, and cut it with the jigsaw. Then we just peeled the paper backing off of the adhesive strips and stuck them in place. They’re basically the most industrial stickers on the planet. Every piece we put up, Robert and I just oohed and ahhed over it. It’s pretty cool to see all of the great textures up close. Now our bar is protected from swinging feet, and it looks extra rustic which is always a win in my book. 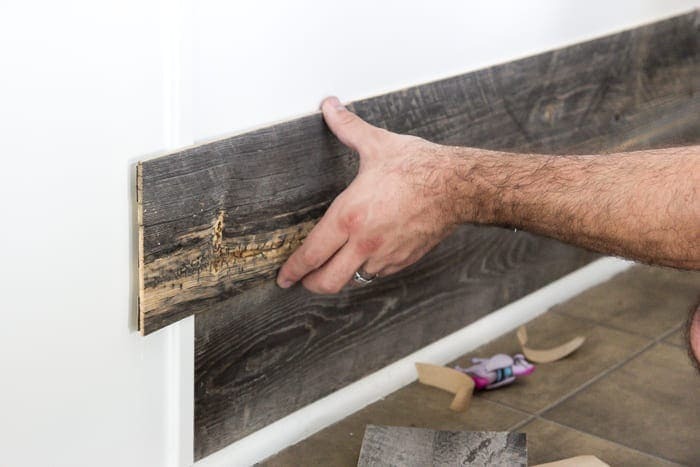 If one day down the road we or our house’s future homeowners decide the reclaimed look needs to go, the wood can just be pried off since no nails were used. I’m really hoping to install hardwood floors one of these days, since our vinyl really isn’t all that spectacular. But maybe we’ll make that Phase 2 down the road. So now the next check on the list is to pick out bar stools, and then we’ll be very close to having this space done. Yesterday, we were able to have our new stainless steel range delivered (30% off appliance sale at Lowe’s… woot woot! ), so things are looking much more cohesive in here. We still have a few leftover Stikwood pieces, so I’m already brainstorming ways to use them since ya know… reclaimed wood is too good to waste. Must. save. all. the. pretty. barns! Lauren, the stikwood looks absolutely amazing! 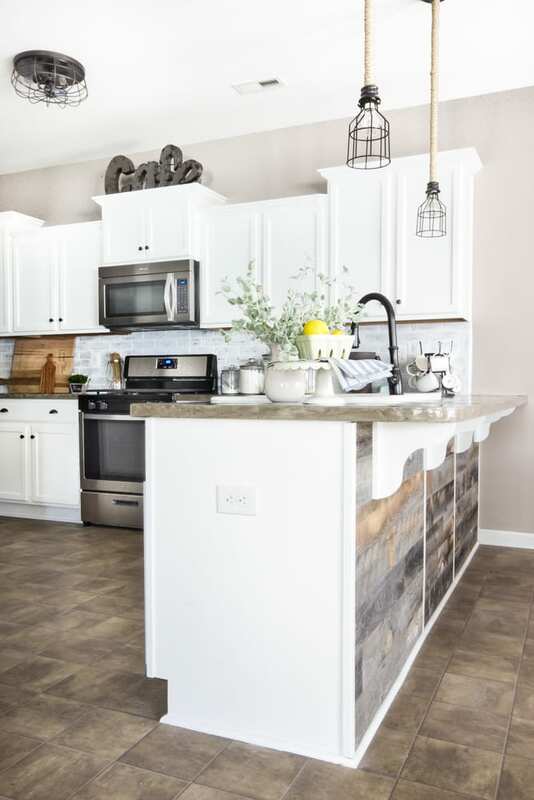 I love the weathered wood look in your kitchen. I think we may have to use this in our shop! Thank you, Kristen! It is very cool stuff. I’d use it everywhere if I could get away with it. 😉 Ours was a little trickier since we had small sections to work with, but on a big wall, it would probably go much faster. Your kitchen has turned out amazing! I love everything about it. I have a question about the IKEA sink – how has it held up so far? Do you like it for use, not just looks? Do your pots and pans leave gray streaks on the surface? Thanks, Kim! I’m still LOVING our sink! It’s held up beautifully. And we haven’t at all tip-toed around it. No streaks at all so far and it cleans very easily with Comet. Comet is quite abrasive. I prefer Bar Keepers Friend, especially the soft scrub, and I have the powder too for tough jobs. The key to using it is to spread it around well and let it sit for 5-10 minutes, then scrub and rinse. It has a mild solution of oxalic acid, which lifts stains. I have a 50 year old worn pink kitchen sink and it works great even though the enamel is rough and pitted from years of scrubbing with Comet. Powdered oxalic acid can be mixed into a paste and applied on wood floors or even fine furniture to lift old stains, even ink. Like the makeover, and I think the extra pieces could look great on the side of the pennisula! Cool stuff, looking good too! Just to let you know, I bought vinyl plank flooring at Lumber Liquidators and redid my whole house by myself (I’m 73). 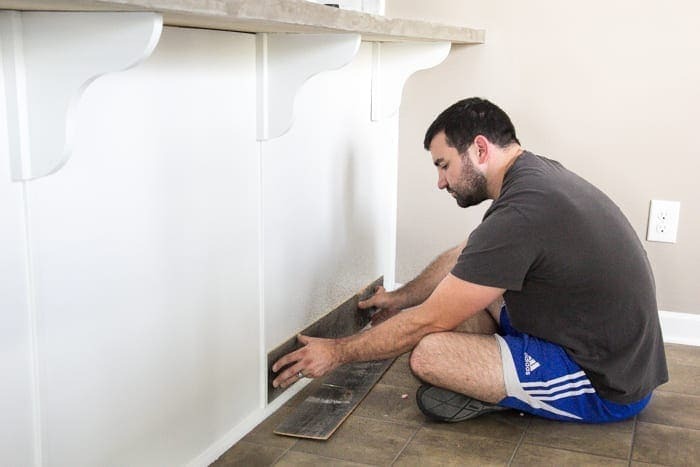 Check that stuff out, you can just lay it over the present vinyl flooring (I tore up carpet and vinyl) and it looks like real wood. Very inexpensive and it’s been down over a year and still looks great! Amazing stuff. Love your blog and your ideas! Wow! That’s awesome, Linda! It’s definitely on my bucket list if we’re still in this house in the next year. I’ll have to check that out that one. Thank you so much! Thank you, Ardith! So glad it’s giving you some ideas! 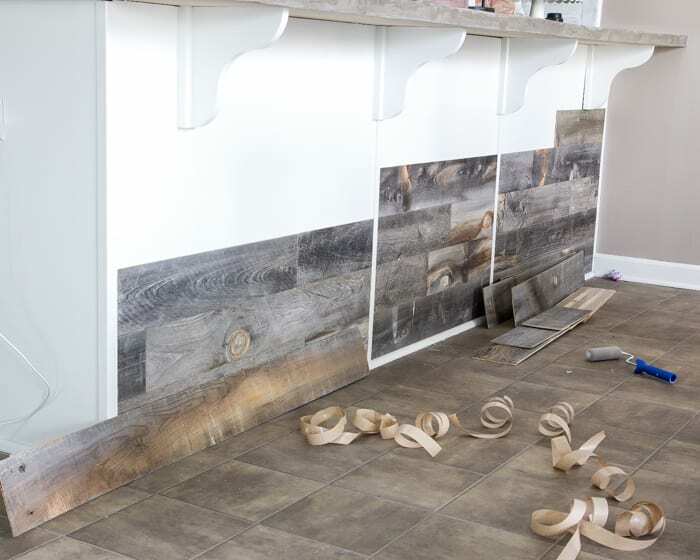 Luv stikwood, luv your kitchen, luv your home, luv YOU! Am I the only one that sees pictures in the wood? In the middle of the middle section, I see a big eye. Down one board, a girl with prairie land behind her. Next down, more of the prairie! This is fun to look at! Thank you for sharing your home with us! Love this product!!! I think this will be perfect for our little toilet room. Good thing it’s little cause it’s kinda pricey. Just found your blog and I love all your ideas!! Thanks! Thank you, Betty! Yeah, it’s a downer that it’s not really the cheapest solution. Hopefully, it’ll be cheaper one day. 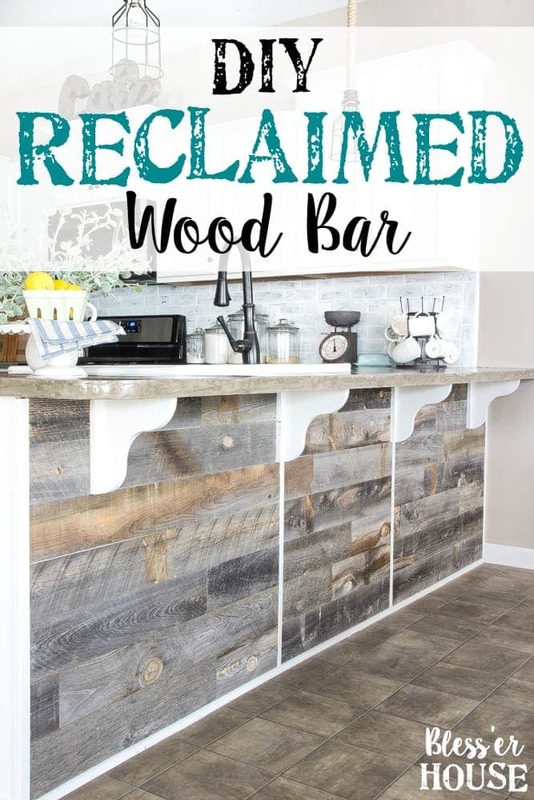 But I do like the fact that we weren’t driving a bunch of nail holes into our bar in case one day we didn’t love the rustic wood look anymore. That plus reclaimed wood can be difficult to harvest and clean and everything. I was not about to fight the creepy crawlies in a barn for this one. Haha! Oh my goodness! Lauren, it’s absolutely perfect! 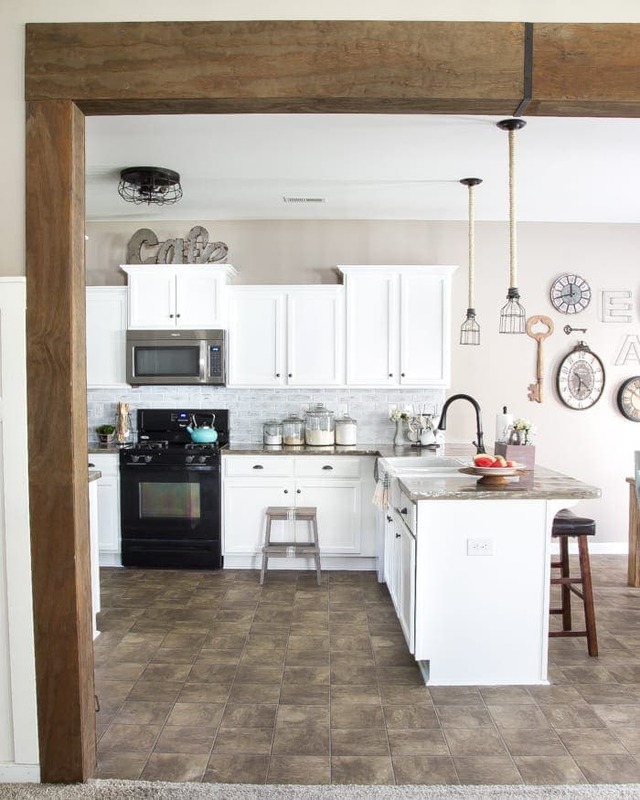 LOVE, LOVE, LOVE that barn wood, especially paired with your lovely white cabinets! 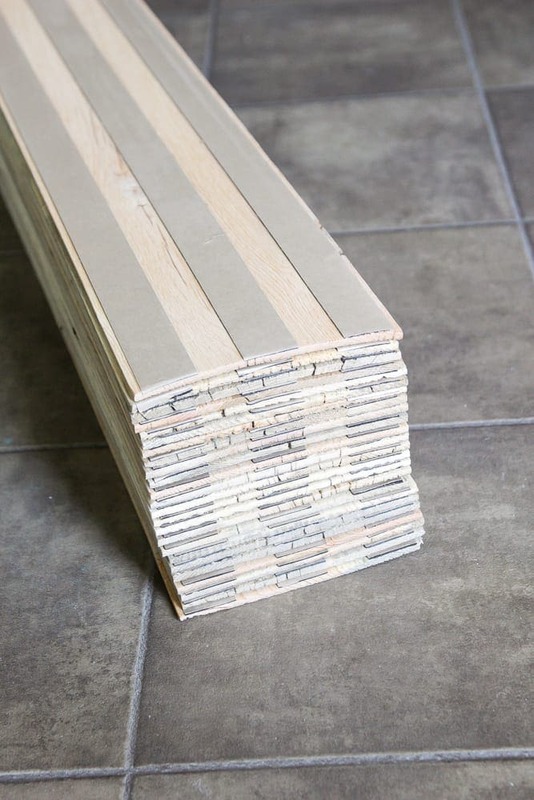 love, love love it and it looks terrific with your floor. Love how it turned out.Love your kitchen and your home! Will have to check and see if its available here in Ontario,Canada. Thank you, Dianne! If it’s not shipped through Stikwood directly, I think you can still order it through Amazon. Lovely results. Truly beautiful colors/style you choose. 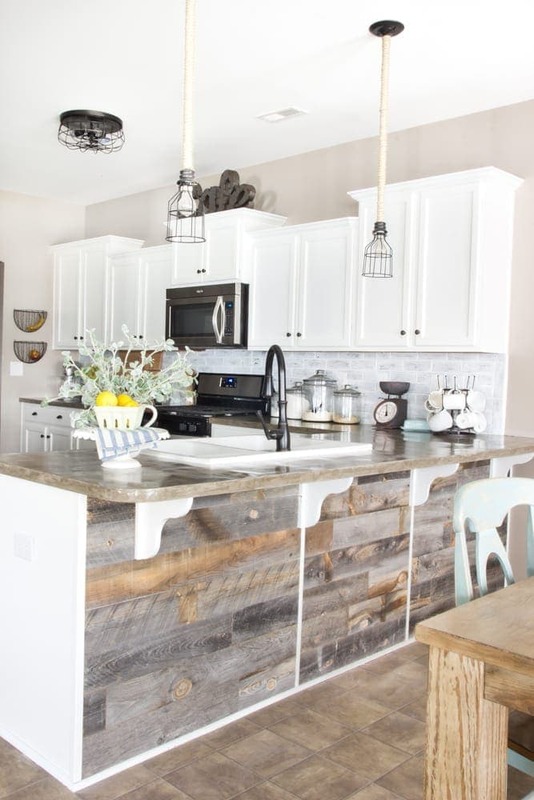 Love your kitchen and wood bar … great idea! Can you tell me where you bought the Café on top of cupboard? Thank you!! Thank you so much! I found the Cafe sign at HomeGoods about 2 years ago. Gorgeous! I didn’t know there was such a things as adhesive reclaimed wood. Love it! Now I’m thinking of ways to use it. Headboard? Isn’t it awesome!? I’ve been wanting to try it since I found out about it a year ago. I’ve seen it used as a headboard too! First I read “I am Handyman. Hear me grunt” and I burst out laughing. Then I scrolled down and saw the picture…..it was ages before I could read again, for the laughter tears rolling down my face!!! The humour in your home is wonderful.! Lauren do you have enough spare Stikwood pieces to add to the end of your peninsula..? 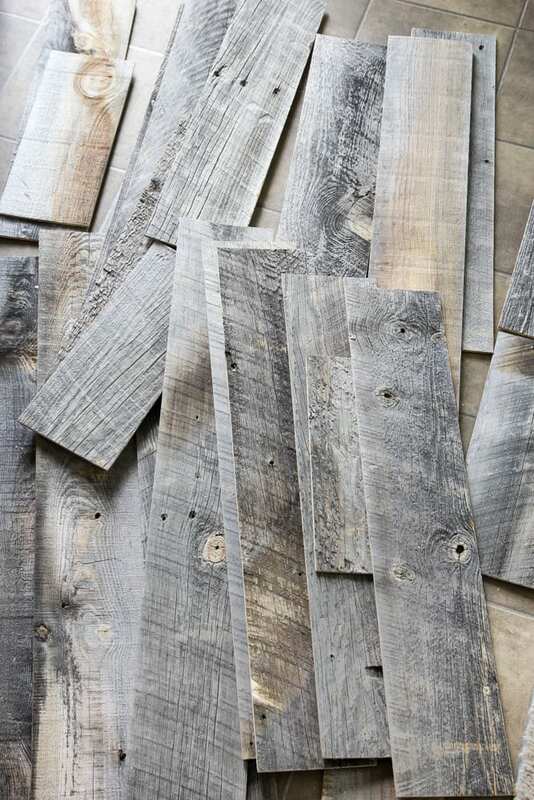 I think it would give the appearance of the whole unit being made from reclaimed wood…. Love the look of your bar now! It’s a perfect contrast to all the white. I also think the end panel would look fabulous with the wood applied there, too. That way you get the rustic look from a different angle when the front isn’t in view. Can’t wait for the whole room reveal! This looks fabulous!!!! It’s a picture I know but I thought you got new flooring as well. (so it must have enhanced what you have❤️). I thought about something like this under my counter bar but I like your look better!! Barstools will be fun to find. When you find them, you’ll just know!!! And you’ll love them and so will we!!!! Thank you for sharing and inspiring!!!! Thanks, Gwen! You are always so sweet. 🙂 For the barstools, I’m thinking white metal and wood ones to sort of marry the bar and cabinets. Hopefully they’ll work out like I have pictured in my head. Lauren, could not stop laughing!!! what fun you must have had doing this!! it looks lovely and really flows with the overall feel of your home!! I do agree the end piece done the same would finish it off beautifully!! otherwise great job for both of you!! Hope you plan to stay in this home, you’ve done so much to make it your own! Haha! It’s always a blast with this funny hubby of mine around. We’re definitely thinking now that the end needs the wood on it too. Not sure if this is our forever home, but we’re loving where we are. Thank you, Pat! Hey Lauren! I’m fairly new to your blog and have been loving going through some of your old posts! 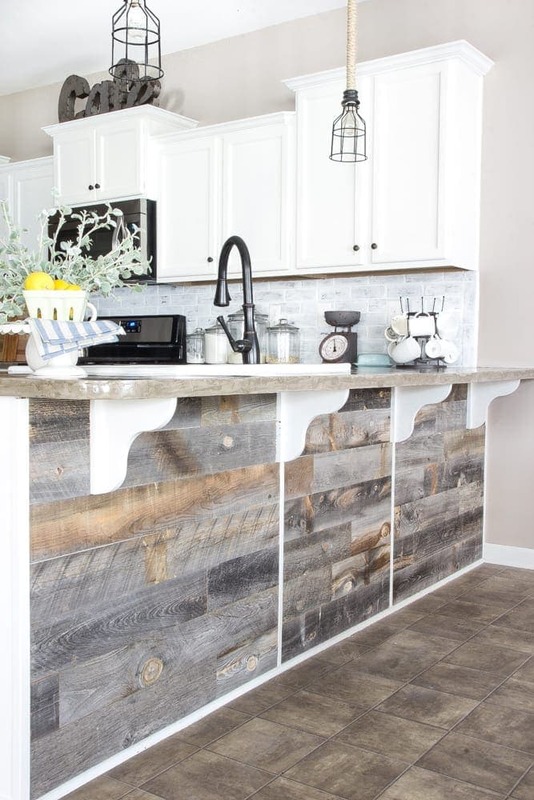 I am looking for a way to add a little something to my kitchen island and this is perfect!! I have really dark (espresso like color), distressed hardwood floors and white cabinets. What color do you think would be the best for me?! Thanks in advance! Ooh, I think you could go in either direction. But the weathered white would look gorgeous! I almost went with that one.